Homepage. 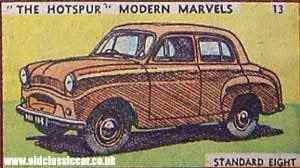 This page: A classic Standard 8hp featues on the cover of Hotspur in 1955. One of Britain's Modern Marvels - the Standard Eight. I found this interesting old copy of Hotspur late in 2006, while rooting through a mound of old papers and comics in a secondhand bookshop. Each week three 'modern marvels' were featured on the comic's cover, and this week it was the turn of the Hawker Hunter jet fighter, the Standard Eight, and a diesel-electric pilot vessel named Wyuna, with a drawing of each. "This four-door saloon is the lowest-priced car amongst the Standard Co's models. In spite of its size, the Standard Eight can cruise at 45mph, and its engine develops 28bhp at 4500rpm. There is a synchromesh gearbox, and independent front wheel suspension. The Eight weighs 13cwt 28lb, and has a turning circle of 32ft. Top Speed 62mph. Cylinders, 4. Length, 11ft 10in. Gears, 4. Tank, 7 galls. Fuel Consumption, 40/50 mpg. Engine, 803cc. British Total Price, 481 GBP". I owned a Standard 8 briefly a little while back, and ran a 10 and 10 Companion (estate) for quite some time as regular runabouts. Return to the Motoring Collectables section. 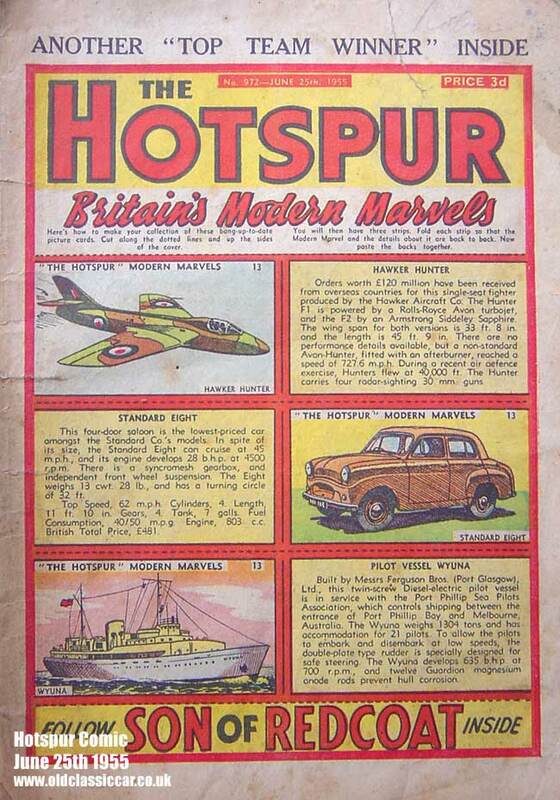 Another copy of The Hotspur magazine features in this section of the site. Dating to 1948, this copy of The Hotspur features the Mille Miglia road race on its cover.